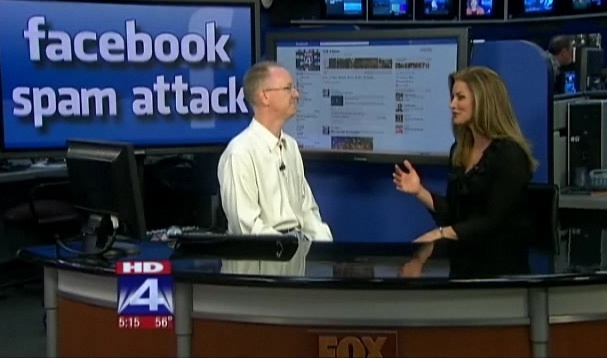 November 17, 2011 By John P.
I went and had a little chat with Heather Hays on the Fox 4 news last night about the latest news that Facebook was hacked. Occasionally the Fox team also shares segments on the Web, and this happened to be one of them. So here’s my little explanation (in layperson terms) of what happened. What do you think? Do you have a better way of explaining it so that even your grandmother could understand what happened? If so, please share! I think you did a great job. I appreciated that you said it could happen to anyone. I think it was Einstein who once said, “If you can’t explain it simply, you don’t understand it well enough”. Well I think you nailed it. Great pace and discussed as plainly as possible in a way that non-computer folk could gist-fully understand. Ha! I was about to ask you if you could read between the lines of what “that guy” on their was saying. So, I get to ask you directly: Did I detect you avoiding civil slander charges (or just trying not to be too controversial) by being “nice” about WHY Facebook had this vulnerability? :) I feel like you know, and I know, and I wonder if it secretly disgusts you as much as it does me? I am currently editing a short piece documentary on the history of the WWW, how we geeks took it for granted that online sites feared us (they did) and then as we got more and more of our family members using computers, the next thing we knew, we were profoundly outnumbered by end users who liked shiny pretty computers that “just worked”, and the online companies all laughed at us as they began stripping the privacy away from the masses who didn’t understand, or didn’t know why they should care. It went from companies terrified to have the back lash from us geeks where the slightest accidental privacy breach solicited a profusely apologetic CEO statement, to where it’s PURPOSEFUL now, (thanks to Facebook blazing the trail to show companies how the opt-IN scam nets millions) where we old school geeks are jaw-dropping incredulous to see Amazon converted all user accounts to their REAL NAMES, publicly viewable, and now attached to every comment you ever made (and thereby often to a product you had purchased). Wonderful for those of us who didn’t know it happened (missed the spammy looking notification email, imagine that) only to log in a few years later to see ALL THAT TIME our REAL NAMES were visible to everyone who even whimsically looked. Incredible.